Arizona congresswoman Gabrielle Giffords is hoping to attend the April space shuttle launch that will send her astronaut husband into orbit, even as she recovers from a gunshot wound to the head, according to wire reports. 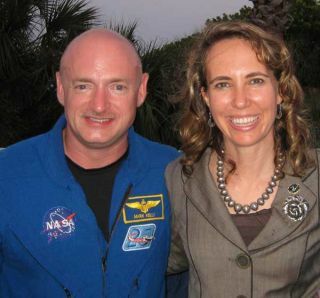 An aide to Giffords, who is currently undergoing rehabilitation in a Houston center, told Reuters that the injured congresswoman does plan on watching her husband Mark Kelly blast off on the shuttle Endeavour's final mission on April 19. But her medical condition, along with other factors, will dictate the final decision, officials said. "The plan is for her to attend," Reuters quoted Giffords' spokesman C.J. Karamargin as saying Wednesday (March 10). "That it is a goal that we are working toward, and we certainly hope that she'll be there." Giffords was shot during a Jan. 8 shooting spree by a gunman at a community event with constituents at a supermarket in Tucson. Six people were killed and 13 injured in the attack, including Giffords. The accused assailant Jared Loughner, 22, pleaded not guilty Wednesday to 49 charges related to the attack, Reuters reported. Last month, Giffords was transferred from her hospital in Arizona to the TIRR Memorial Hermann Hospital in Houston for a lengthy recovery program. The move allowed Kelly, who lives in Houston and works at NASA's Johnson Space Center, to continue training for his shuttle mission while staying close to Giffords. TIRR Memorial officials plan to hold a press conference Thursday morning to provide an update on Giffords' recovery. Kelly announced last month that he intended to continue training with his crew in order to lead Endeavour's STS-134 mission to the International Space Station. The decision, he said, was based on Giffords' improving condition during her recovery. "I feel very confident that I made the right decision not only for me, but for my crew members, my family and for my wife," Kelly told reporters on Feb. 4. Kelly's family includes his identical twin Scott Kelly, who is also an astronaut and currently commanding the International Space Station. The space shuttle Endeavour casts a shadow on NASA's enormous Vehicle Assembly Building as it rolls to the launch pad for its final mission STS-134 on March 10, 2011 at the Kennedy Space Center in Florida. Endeavour is slated to launch on the mission on April 19. During Endeavour's upcoming spaceflight, Mark Kelly will command a six-astronaut crew on a 14-day mission to deliver spare parts, supplies and a $1.5 billion astrophysics experiment to the space station. Four spacewalks are planned. The mission will be NASA's 134th shuttle flight and Endeavour's 25th and final flight. The shuttle moved to its Florida launch pad late Wednesday night. Endeavour is being retired this year along with NASA's two other shuttles currently in service. Its last flight follows the final voyage shuttle Discovery, which landed in Florida on Wednesday (March 9) after a 13-day flight to the station. All three of NASA's shuttles will be sent to museums for public display once their spaceflying careers are over, NASA has said.